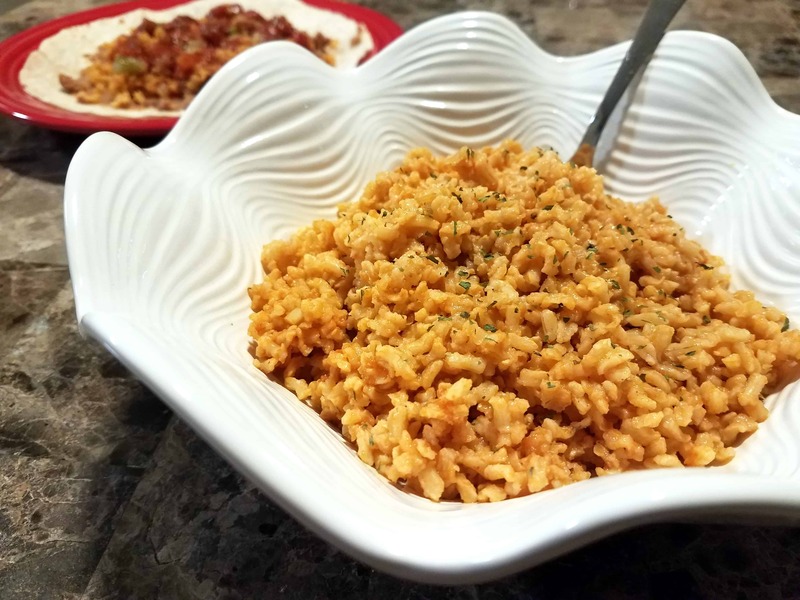 This Mexican rice is very versatile, and can either be served as a side to most Mexican dishes or served as part of a burrito! Heat extra light olive oil over medium-high heat until it begins to shimmer. In a strainer, rinse rice under running water. Add rice to pan, and toast until the rice emits a nutty fragrance, and the tips of the grains start to toast. This should take around 5-10 minutes. Add in tomato sauce, chicken broth, garlic clove, cumin, salt, and pepper. Give the pot a good stir to mix everything and then cover with a lid. Once the mixture starts to boil, reduce the heat to low and simmer for 30-40 minutes, or until all the liquid is absorbed. Fluff rice before serving and enjoy! This recipe makes a TON (~2.5 quarts) of cooked rice. If you are cooking for yourself, I would recommend halving the recipe, or freezing half of it. If you decide to freeze the leftovers, be sure to flatten the freezer bags like pancakes before placing in the freezer. Credit: Recipe adapted from Kristyn at Lil' Luna. I have really learn a new type of rice cooking, that i have never tried before. I must it today at my home, thanks for sharing. Yum! This look so simple but also so delish! I always think the simpler recipes with only a few ingredients turn out the best. I love the idea of seasoning the rice before boiling it, so the flavors really get thoroughly infused. It’s such an easy recipe to make and it’s packed with flavor thanks to the cumin, chicken broth and more. I could easily make this at home! I also love using Himalayan pink salt for cooking. Yes! I love the Himalayan pink salt. I read about it somewhere and was like ooo I need to get my hands on this. Wegmans has a Himalayan salt grinder which is handy. I find that I can get away with less of it vs using regular salt, because it has so much more flavor. That looks delicious! I always go crazy with cumin in my cooking as I love the flavour so much! I think with some paprika powder will add a nice kick to this rice as well! Delicious, just reduce the chicken broth and add some potatoes and onions and we eat this rice preparation weekly as a quick and light dinner. My family loves Mexican rice. I am sure that they would love me if I made this for the household. Usually we have purchased it or found some box recipe but this sounds so much better. Yeah, I couldn’t cook it for just me. 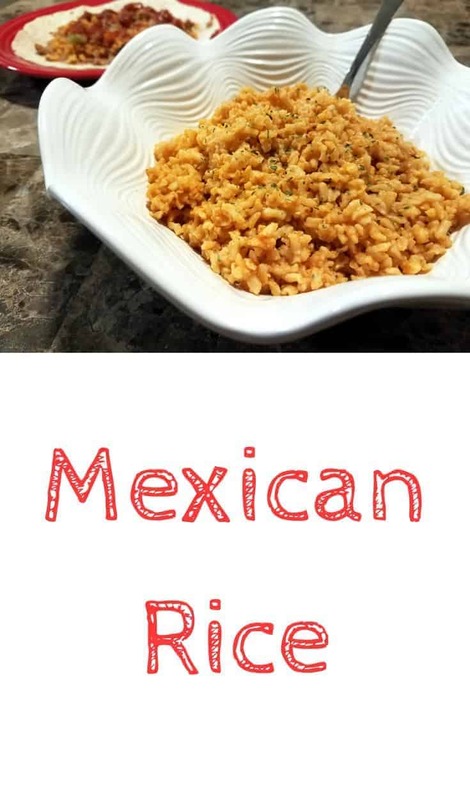 Mexican rice is my all time favorite though I have never used chicken broth to make it. I am a vegetarian ? I have never tried any Mexican food before. This seems like an easy recipe for a beginner like myself so I can give it a try. I love this recipe for a few reasons. Anything that you can make a lot of and freeze is automatically great. Not being a wonderful cook, this also looks easy to prepare. Plus looking through the recipe as well as seeing your photos, it does look really yummy as well. I am inspired to give this a go! Thank you. this looks so yummy. I am in love with rice, thank you so much for sharing the recipe, I shall give it a try. This recipe looks delicious and it doesn’t seem that hard to make! I also love how it doesn’t take that long to make! Im excited to give this a try next time we make Mexican food! I love rice as a side dish. Mexican Rice is one of my favorite varieties. I don’t think it’s too spicy and it brings out the flavors of the other foods. i would def love to give this a try! i always lve good mexican rice! this looks absolutely delicious and I’m going to cook it right now 😉 I’m sure it would be great! Mexican food is always fantastic – and this recipe brings back many great memories of eating in Mexico.